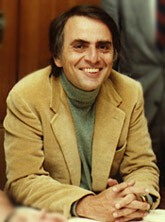 Carl Sagan (1934-1996) was a famous and brilliant astronomer who was also a great speaker and presenter. I was a big fan of Carl Sagan back in the 1980s and learned a lot from Cosmos, we all did. Sagan spoke of complex issues in ways that were easy to understand and made you excited about science. He did not dumb down the issues, he simply had an engaging and unique way of putting the issue in context and illuminating and illustrating his points in a way that listeners could comprehend. He was a scientist-presenter who cared about being clear and about being understood. "Today, two megatons is the equivalent of a single thermonuclear bomb—one bomb with the destructive force of the second world war." "How would we explain all this to a dispassionate, extraterrestrial observer? What account would we give of our stewardship of the planet earth?" By asking us to look at the problem from the point of view of an "extraterrestrial" (i.e., a dispassionate outside observer) then the problem need not be obstructed by abstractions such as nation, political party, religion, etc. Sagan says that "from the extraterrestrial perspective, our global civilization is clearly on the edge of failure and the most important task it faces is preserving the lives and well-being of its citizens and the future habitability of the planet." 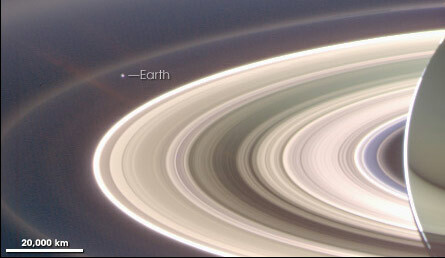 Below is a quote from Carl Sagan's Cosmos that goes very well with this photo of Earth I pointed to earlier. Below is a slideshow set to Carl Sagan's narration. The message is wonderful and the simple photographic images amplify the message well. I think this is beautiful and puts "it"—our lives, our responsibilities, worries and our dreams—in perspective. It is this distant image of our tiny world—the only one we've got—that underscores, says Sagan, "our responsibility to deal more kindly with one another" and to preserve and cherish our home, the planet Earth. Some of the graphics will seem a bit dated in this clip below, but this clip is a good example of using a metaphor and simple graphics to help illuminate a complex issue. You can argue that it is too simple, but remember that this kind of calendar metaphor to explain the history of the universe is not meant to be the end of the conversation, it is only meant to be the beginning. We have a choice, says Sagan, but what happens in the first second of the next cosmic year (i.e., now) depends on what we do with our intelligence and knowledge. 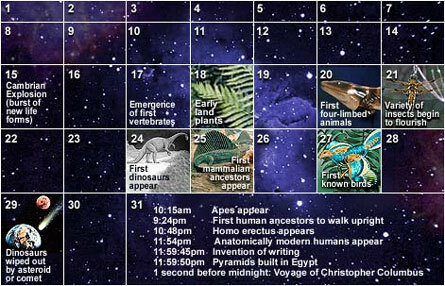 Here's the Cosmic Calendar from Discovery Education. Each month represents about one billion years. December of the "Cosmic Calendar." The same version of this article (with some editing) appeared in the magazine Communicating Astronomy with the Public (CAP) in 2008 (PDF available here). Also available on the The Smithsonian/NASA Astrophysics Data System website here. As we are all getting quite excited to see the new Cosmos with Neil deGrasse Tyson — another great communicator of science —I thought it was worth posting this here. Yesterday, I was deeply moved by the beautiful spirit of a young, creative, and intelligent woman, a woman who I've never met. I was not the only one. Thousands of people have now been moved by the amazing work and personality of 23-year old Zina Nicole Lahr from Ouray, Colorado. On November 20, 2013, Zina died as a result of a fall while hiking alone in the trails near her home. A devastating and tragic loss for her family and friends. Zina was a remarkable woman. I know this to be true all due to an amazingly simple yet beautiful 6-minute film created by Zina's friend and film student Stormy Pyeatte. Thanks to Stormy Pyeatte's wonderful film, tens of thousands of people worldwide have been inspired by Zina's fantastic energy and incredible creativity. Zina was taken from this earth far too soon, but in the nearly three months since she passed, she is still touching people and inspiring them more than she probably could have imagined. The film itself is very well done; such a lovely presentation of Zina and her work. The backstory of the video's creation is that in August, 2013 Zina asked her friend Stormy to shoot a video for her portfolio during the short time they were both back in Ouray. "She needed something that would showcase her work but also tell a little bit about her personality and her interests," Stormy writes on her Vimeo website. "We had two days to shoot and edit so we shot an interview and smashed something together to meet our deadline. On November 20, 2013 Zina passed away due to a hiking accident....After the funeral I revisited the footage and made this short as an attempt to capture her personality and creativity." Watch the 6-min film below. Stormy's work here is truly a deeply touching piece of art. It's just a short, but it's a remarkable short. I have seen it several times now, and each time I watch it I can't help tearing up and feeling a strange mixture of inspiration but also a sinking feeling of loss, a feeling that we lost a truly great young mind...a great young person. My own daughter is only 3-years old now, but when she is older I will show her this film. • Stormy's interview with Aspen Public Radio regarding the video and Zina's life (very moving). "The greatest part of a writer's time is spent in reading in order to write," Samuel Johnson once said. "A man will turn over half a library to make a book." In order to make any kind of contribution during this short time on earth, I need to study the contributions of others. In spite of my love of film and video and live presentations/lectures, and so on, nothing beats reading. And reading books is the best form of reading. I prefer books over articles and blog posts in the same way that I prefer albums over songs. With the advent of digital books, I certainly purchase many more books today then I can actually read. But still I press on, trying to read as many books as I can. When we read books—good books anyway—it feels more like we are having a conversation with the author. We can take our time, we can slow down, we can stop and think about what we have read. Books, more than just giving us "how to" lists and prescriptions for success, should stimulate us to ask questions and to think critically. Here communications expert Nick Morgan looks at recent brain and behavioral science revelations about how we communicate.There are essentially seven sections in the book: 1. Knowing Your Own Power Cues (Becoming Self-Aware and the Significance of Gesture). 2. Taking Charge of Your Non-Verbal Communication (Projecting Your Desired Persona – Through Your Emotions) 3. Reading the Unconscious Signals of Others (How to Recognize and Understand Emotional Cues in Gestures) 4. Mastering Your Own Voice (The Most Powerful Leadership Cue) 5. Communicating as a Leader (Combining Voice and Body Language for Success) 6. Using Your Intuition Effectively (What Your Gut is Really Saying – and How to Leverage It) 7. Synchronizing Minds (How to Use Story to Get on the Same Wavelength). I liked the story chapter the best. Story works for us as leaders, Morgan says, "because it matches the way our brains work." At 225 pages it is a quick read and a very good read. Also recommend Nick's Trust Me: Four Steps to Authenticity and Charisma. This book is great for facilitators, workshop leaders, and teachers. It includes 51 activities (with hundreds of variations) to help your participants/students think about and discuss issues. The activities cover a wide range of topics such as: problem-solving, team building, communication, emotional intelligence, design, creativity, sales/marketing, global culture, etc. Each activity comes with recommendations for topics, the number of participants, timing, etc. In the interest of full disclosure I should say that I have worked with Glenn on several of his visits to Japan over the years. Glenn is an award-winning facilitator and an adult education and training specialist. He's been designing and doing these activities with good results for a long time. Here's a video of Glenn explaining a little bit about Photo Jolts. Early on in the book Cain talks about how the US went from a culture of character to a culture of personality. "At the onset of the Culture of Personality, we were urged to develop an extroverted personality for frankly selfish reasons—as a way of outshining the crowd in a newly anonymous and competitive society. But nowadays we tend to think that becoming more extroverted not only makes us more successful, but also makes us better people. We see salesmanship as a way of sharing one’s gifts with the world." Problem is, as many as half of us may be introverts. "Should we become so proficient at self-presentation that we can dissemble without anyone suspecting? Must we learn to stage-manage our voices, gestures, and body language until we can tell—sell—any story we want? These seem venal aspirations, a marker of how far we’ve come—and not in a good way—since the days of Dale Carnegie’s childhood." This is such a eye-opening book. Although I speak before large crowds often, I discovered through this book that I am actually more of an introvert than an extrovert, and I am also shy. Shyness and introversion are different things, and it is OK to be either (or both). A few words here can not do justice to the book. Please see Susan Cain's TED talk which covers some of the points in the book. I love Brené Brown's work and I have featured her presentations a few times over the years such as here and here. Telling stories—especially your own stories—requires a certain amount of risk taking. The best stories often occur when the teller opens up and reveals themselves to you, reveals to you their vulnerability. This book is based on years of research which supports the idea that vulnerability is not weakness, but rather the path to engagement and meaningful connections. Through vulnerability we find courage. When we embrace vulnerability we become stronger. The findings and conversations in this book go beyond communication, but will certainly be valuable to anyone dealing with any kind of personal relationship, creative, or work-related communication issues. Informative and inspiring. Pam shows how to find the connections among your diverse accomplishments, sell your story, and continually reinvent and relaunch your brand. "Your body of work," says Pam, "is everything you create, contribute, affect, and impact. For individuals, it is the personal legacy you leave at the end of your life, including all the tangible and intangible things you have created. Individuals who structure their careers around autonomy, mastery, and purpose will have a powerful body of work." Chapter 9 is called Share Your Story. In this chapter she highlights storytelling in the context of presentation and also more broadly, covering the story we tell others through our social media content and so on. This book really got me thinking more about what kind of story I want to create and share through my life and my life's work. Here is an excellent 45-minute interview with Pam by Jonathan Fields where they discuss the content of Pam's new book. This interview with Pam by Nancy Duarte is only about 10-min and cuts right to the chase. I know Gary may seem over the top for a lot of people, but I have to admit that what he says resonates with me. If you are someone on a mission with a story to tell—regardless of what field you may be in—then this book has some good advice for spreading your message. Dan Schawbel has "14 Memorable Quotes" from the book on the Forbes website; this may give you a better feel for the book. Here's one: “A story is at its best when it’s not intrusive, when it brings value to a platform’s consumers, and when it fits in as a natural step along the customer’s path to making a purchase.” And here's another: “Today, getting people to hear your story on social media, and then act on it, requires using a platform’s native language, paying attention to context, understanding the nuances and subtle differences that make each platform unique, and adapting your content to match.” Gary uses many examples from various forms of social media.This book is especially targeted to marketers and business folks, but I think others can get value from this book. Here's a clip of Gary being interviewed on the book. I really liked Asacker's book Sandbox Wisdom, which I read back in 2000 on Tom Peter's recommendation. This 2013 book by Asacker looks more closely at story and belief in the context of leadership. Like his earlier books, it is relatively short and a quick read, but there is enough meat there to get you thinking. "People are drawn across the bridge of belief by their anticipation of a better experience and a better life," Asacker says. "Effective leaders ignite people’s imaginations by painting vivid, compelling, and personally relevant pictures—ones that move them. As John Quincy Adams made clear, 'If your actions inspire others to dream more, learn more, do more and become more, you are a leader.'" Effective leaders, Asacker says, "...know that the essential first step to changing people’s behavior is to understand their perspectives and embrace their desires and beliefs. Everything else flows naturally from there." Here is a 12-min presentation by Asacker on content directly related to the book. If you are going to be a 21st-century storyteller, then you need to know how to create good video. The title is the worst part of the book (it's not about becoming rich by shooting great video), but it is a good book. The book takes you through the basics or getting good shots, etc. and focuses quite a bit on storytelling through video. It is not a book about equipment, but it is a book that will help you create and tell better stories through the art of motion picture (video in this case). Rosenblum's writing is very much like his speaking—very direct, practical and straight forward. Rosenblum founded the New York Video School which offers live courses and also courses online. I have learned a lot by studying the material on their website. Here is a 4-min video interview with Michael Rosenblum discussing the contents of the book. Here is a sample intro to storytelling with video segment from the NYVS courses. And here is a sample on shot sequence from the courses. This list goes to 11, it's just one more isn't it? This one may seem out of left field, but this book written by Sigmund Freud's nephew Edward Bernays is an important one to read if you are at all interested in the principles and techniques that are the foundation of modern advertising, marketing, and public relations (what used to be called propaganda). Bernays is to this day called "the father of public relations," yet it is truly remarkable—and not in a good way—that so few people know of Edward Bernays and his work given the incredible consumerism that is merely taken for granted in much of the world today. His techniques were used to sell everything from bacon and eggs to bananas to cigarettes, and to sway mass public opinion in myriad ways, including toward participation in war. This book was first written in 1929 (so there are free versions such as here), so many examples may seem outdated, but you'll shake your head as you realize that many of the techniques are still used today, for better or worse. Now, I could just recommend that you read books on Bernays such as The Father of Spin: Edward L. Bernays and The Birth of Public Relations, but I think it is useful to read some of these older works from the author himself. Watch this 4-minute video presentation by NPR for a solid overview of Edward Bernays and the kinds of things you'll read about in his book. I mentioned this book back in October with links to one of Seth's new presentations on education.This is a free download. In this 30,000 word manifesto, Seth discusses his ideas regarding education and school. "One thing is certain," says Seth,"if we keep doing what we've been doing, we're going to keep getting what we've been getting." I'm a big fan of Scott McCloud's work. I linked to this 2005 TED talk a few years ago, but it's worth linking to again today. Not only is Scott's content stimulating and directly relevant to our world of presentation, the unique presentation of his story is a wonderful example of what is possible with your basic slideware app (and this is almost nine years ago!). I've talked about Scott many times before on this site (such as here) and I talk about him a bit in the Presentation Zen book as does Nancy Duarte in Slide:ology. This is just a fantastic TED talk and a powerful yet simple use of the slide medium. If the principles Scott talks about excite you, then I recommend his best-selling book on the art of comics (and why and how they matter) called Understanding Comics: The Invisible Art. This is an amazing book with applications far beyond the world of comics. Watch Scott's talk below or here on the TED site. These four guidelines will take you far indeed as you create your own life story. Here is a nice 10-minute interview from a few years ago when Scott was on his 50-State Tour in the US.